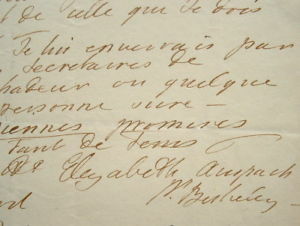 The Elizabeth Craven Society has now acquired this original manuscript letter written by Elizabeth Craven in April 1802, from London, to the Comte de Perrégaux, a banker in Paris. She describes herself devotedly looking after her son Keppel, who has suffered a riding accident. His horse crushed his leg against a tree, and although no bones were broken, he is so severely bruised and grazed that he has been laid up on a sofa for a fortnight. Actually there was nothing Elizabeth enjoyed doing more than looking after Keppel. 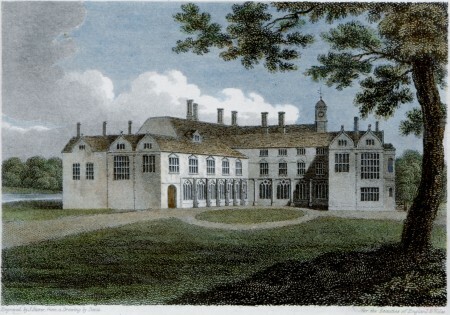 Her youngest child, he was now aged 23, and had travelled in Paris for a while after he left Oxford, but she loved him to return home to Brandenburgh House where she could molly-coddle him and warn him of every possible risk to his delicate health. She also loved him to invite his friends to stay and fill the house with high-spirited young people. Coombe Abbey, the Warwickshire stately home owned for centuries by the Craven family, has always had a reputation for being haunted. The stories go back to its ancient origins as a Cistercian monastery in the 12th century. One ghost is supposed to be that of the Abbot Geoffrey, a monk who was murdered in the cloisters in 1345. And there have been other spectres reported too, including that of a stable-girl named Matilda who reputedly put a curse on the family. Nowadays the house has been converted into a hotel, but the stories linger, and staff and visitors have both told tales of the presence of a "poltergeist" - an invisible ghost who moves, or throws things. So this year, two mediums who call themselves The Shadow Warriors have visited Coombe Abbey to carry out a suitably-timed Hallowe'en investigation.